This statistic shows how Americans plan to celebrate Independence Day on July 4th in 2017, according to a survey conducted in June 2017. Independence Day, also known as the Fourth of July, is a federal holiday in the United States commemorating the Declaration of Independence on July 4, 1776, when the United States declared its independence from the Kingdom of Great Britain. 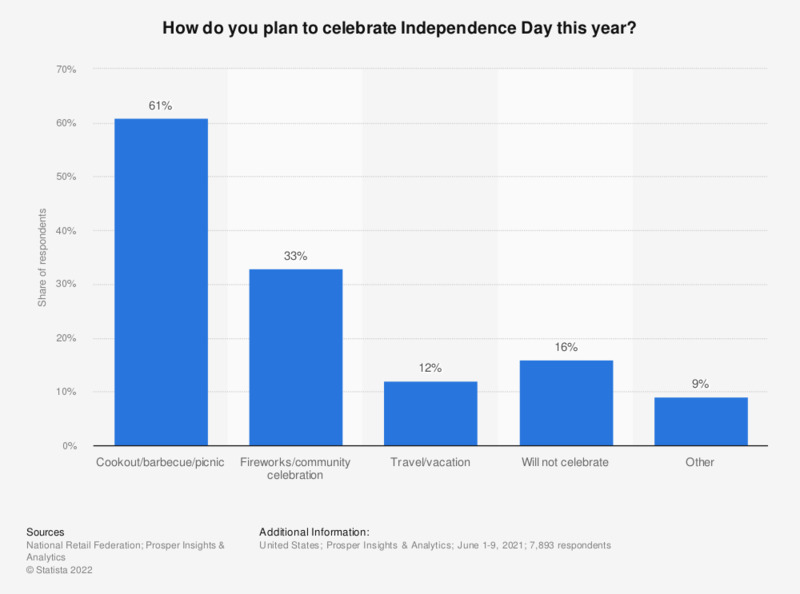 During the survey, 65.5 percent of American respondents stated that they were planning to celebrate this year's Independence Day with a cookout, a barbecue or a picnic. The source does not mention the number of respondents or the type of survey. Are you planning to do any of the following activities on May 17? Do you look forward to Christmas? This Thanksgiving, do you feel you will have more to be thankful for than a few years ago, less to be thankful for, or about as much to be thankful for as you had then? To what extent do you agree or disagree with the following statement: “Bonfire Night is not as exciting as it used to be“?